We are ranked amongst the foremost firms that are engaged in manufacturing, exporting importing & supplying a wide range of High Pressure Seamless Cylinder that is used for industrial oxygen, nitrogen, carbon dioxide, refrigerant etc. The offered high pressure cylinder is manufactured using the best quality basic material and advanced technology in sync with industry norms. Our professionals offer this high pressure cylinder to our clients in various sizes and designs. Maruti Koatsu Cylinders Ltd was established in the year 1989. 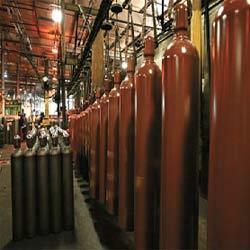 We are Manufacturer, Supplier and Exporter of Gas Cylinders & CNG Cascades. Our products range are High Pressure Cylinder, Medical Oxygen Cylinder and Helium Gas Cylinder. We are one of the leading Indian players in the field of high pressure seamless cylinders for Industrial gases, CNG and Cascades. These cylinders are manufactured in water capacities ranging from 1 to 160 liters, OD from 108 mm to 356 mm and working pressure from 150 Kilogram-force per square to 400 Kilogram-force per square. Our products are manufactured using the latest technology and manufacturing practices and conform to relevant Indian and export standards for domestic and International markets. We are exporting our products Pakistan, Bangladesh, Peru in America, New Zealand, Iran, Tanzania and Sri Lanka & importing from China.